Many off-road campers and RVers require a dual battery isolator setup to run their power hungry gadgets like GPS, laptops, smart phones, refrigerators, televisions. Over the years, we have killed the starting battery on every vehicle by running our laptops, charging cell phones, and leaving the vehicle's dome light on. Since installing the second battery, we have not drained the starting battery. I built a portable 12 volt power supply using a LifeLine sealed AGM 80 AH battery, a CTEK D250S battery isolator, 30 amp fuses, 12 AWG wire, and six 12 volt cigarette style sockets. With this set up, I am able to run my 62 liter ARB fridge/freezer over night without risking my starting battery because it's isolated from the house battery. A dual battery isolator set up poses no risk of killing your starting battery because the starting battery is not used for powering devices. Rather than going the cheap route with mechanical solenoid as a dual battery isolator setup, the CTEK D250S gives you a smart computerized dual battery isolator, solar charge controller, and 5 stage battery charger built into an easy to install unit. My dual battery set up cost me a over $300 which is more than the How To Make A Cheap Battery Isolator Set Up For $50 detailed on the Expedition Portal Forum. This does not include the $280 Life Line AGM battery. I scored a deal on the CTEK D250s. My friend supplied the wiring. I paid for the battery box, fuses, and fuse holder. If one paid full price for my set up, it could be built for under $400 including the CTEK D250s. I designed the system on paper and let my tech savvy electrical engineer buddy perform his magic with a few tools, flashlight, and the wiring diagram for my Ford E150 van. Here is a photo of my completed dual battery isolation kit for my Ford van. I used the LIfeLine sealed AGM 80 amp hour deep cycle battery purchased from Invertors R Us. They had the best price online with free shipping. Decent Chinese equivalent sells for for less from online retailers like Walmart, eBay, and Amazon. After nearly destroying my expensive LifeLine AGM battery, I think it's worthwhile looking at less expensive battery options. I installed six 12 volt cigarette lighter style sockets to the side of the battery box and connected these to a 6 block fuse box with 30 amp fuses. One of the 12 volt sockets is a dual USB port. I strapped a cheap 300 W power invertor on top of the battery box. I don't rely much on the power invertor as it's an inefficient use of electricity. It's been sitting in my shed for years and now I occasionally use it to power my burr coffee grinder. Using a smart battery isolator like the CTEK D250S, there is no need to use expensive and bulky 4 awg wire as 10 or 12 awg wire is sufficient for battery charging. I designed the portable dual battery system for my Ford E150 camping van and asked an electrical engineer friend to piece it together install it. I wanted the dual battery installed permanently and he advised me that a portable supply is the way to go. Many Ford trucks have a fused auxiliary trailer battery power supply running out of the main fuse box. My friend found the schematics in the Ford Factory Manual and the auxiliary battery charging wire was located about 2 feet from the firewall. He pushed the wire through the same hole as the emergency brake cable hole. This saved us from having to connect directly to the battery and running the wire under the frame. If you don't have a factory manual and want to go the easy route, most dual battery isolators like the D250S or solenoids connect directly to the starting battery. My friend Dan connected this 60 amp fused wire running from the main fuse box of my van to the connector on the D250s marked both with"in"and a picture of an alternator with 12 AWG wire. We connected the ground to black connector marked "common". CTEK advises to connect directly to the battery. The Ford factory wiring on my E150 uses 12 awg with a 60 amp fuse for the auxiliary trailer battery charging circuit. I went with the factory specifications and suggest you do your own research. Use an online wire chart to determine cable size because voltage loss occurs with increased length. We wired the D250S with 20 feet of Temco 12/2 SOOW SO cord purchased on eBay. The SO cord is nice to use because the wire is packaged inside a rubber like material that is resistant to heat and oil. He bought the quick connects for SO cord at Home Depot. Engineer Dan disabled the "hot" connection on the plug so there is no way someone can plug it into a standard 110 v AC circuit. Our concern is some fool may try to plug the battery into an AC outlet with the matching male end. W used SO cable because it's available, cheap, and is easy to use. Dan connected the positive (red) battery terminal directly to the CTEK service battery connection(see picture). We connected the negative terminal of the battery post to the common (ground) post on the CTEK. This Quickbox RV battery box is adjustable. It has enough room to wire the 12 volt sockets and install the CTEK D250S inside. 6 Block Fuse Box At Amazon including fuses. 12 Volt Sockets Ebay. About the cost of a cup of coffee. Temco 25 feet 12/3 SOO cord Ebay. This stuff is 100% copper, convenient, and ready to use. Assorted Fuses, Harbor Freight or Amazon. Never hurts to carry extra. Temco Crimper Tool at Ebay. Makes the job easier. 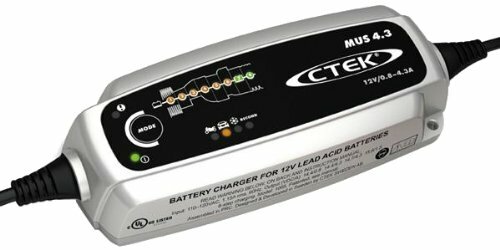 For charging my vehicles at home, I bought the CTEK 4.3 12 volt battery charger. The quick connects makes it easy to charge all my vehicles. A few of the key benefits include a patented de-sulphation process that removes sulfate from the lead plates. This may extend battery life. A battery diagnosis that shows if a battery can receive and retain a charge. A special reconditioning function restores stratified and deeply discharged batteries. The charger comes with quick connects and alligator clips for easy use. I added a 160 watt solar panel that I bought from ML Solar in San Jose for $160. Anderson Quick Connectors were used to connect the AGM battery and solar cables. The entire set solar set up cost around $250. We took the van on a 5 week 8,000 mile cross country camping trip. The solar powered the 63 quart ARB fridge/freezer for 5 weeks. Thanks for the informative article. Just what I’ve been looking for. But what year was this written? And now did you make all of this for $300 when the battery is about $270 and that Ctek D250S is also around $270? It looks closer to $600 when all is said and done. My cost is for the dual battery isolator and does not include the battery. I changed the text to clarify this. Thanks for pointing this out. What keeps you from draining the house batteries too low? I have a battery monitor that tells me the voltage of the house batteries. My Renogy solar charger also tells me battery voltage and percentage charged.